Day 11 - Back in the USA! Our day 11 on this incredible journey is our final day and will really be two days as we fly back home and gain back many hours and go back through the time zones to the US. We are all so looking forward to seeing our families and loved ones that we miss so much and we are ready for this adventure to come to a close. We woke on Tuesday to continued rain in Pretoria. Since Sunday, it’s been raining off and on – mostly on – for 3 days straight and we are told this is very rare for the area as this is not a rainy season. The benefit for us has been that even though this has been a “summer” trip into the southern hemisphere, we really have been quite comfortable and many times cool, so we are thankful for that. As you can imagine, the day was spent packing and loading and transporting from Pretoria to Johannesburg and saying our final goodbyes to many new friends and brothers and sisters in Christ that we have met (or for some, renewed friendships). In addition to those at Hope Baptist, this includes our very gracious hosts, Peter, Sunette and Levson, at the bed and breakfast inn where we stayed throughout our visit. We also said goodbye to Katie’s friend Busi, who boarded a bus in Pretoria to begin her night-long journey back to Zimbabwe. It was such a joy to have Busi and her sweet spirit join us these many days – she was such a blessing to us all. We boarded the plane in Johannesburg on Tuesday evening around 8pm and strapped in for the longest ride of all – almost 17 hours from South Africa to Atlanta. We have survived that and arrived in Atlanta and went through customs on Wednesday morning before 7AM. We are writing this final post while en route (another 4 hours in the air) from Atlanta to wonderful Phoenix and will arrive just after 10:00AM Arizona time. As we reflect on this trip, we are blessed by so many things and could write endless paragraphs about how God arranged things the way He wanted, or as we have said many times, given us Divine Appointments. We are overwhelmed by the experience with the African people and our privilege to talk and pray with so many of them face to face. We are delighted by the many decisions for Christ that were made this week and humbled by the protection he granted our team even in the midst of a scary situation while literally stuck in the middle of a wild game reserve – none of us saw that coming, but our Lord did and showed us His love yet again. ﻿While this journey has come to a close, we hope that you do not stop praying as the journey of Hope Baptist Church in Pretoria is a work of God in progress. Pray for Julius and Cintia and the leaders of HBC as they must now take on the monumental task of the followup of many hundreds of new connections that were made with the residents of Sunnyside this week. Pray that they not lose heart and give them the strength they need to nurture and harvest those seeds that were planted. Pray for the people of Sunnyside that were introduced to the ministry of Hope Baptist, and for those that were introduced to Jesus – pray that God is continually revealed to them and that lives are truly changed. Pray for this team at First Southern as we return home and that we are forever changed by this experience – that we are reminded daily and apply the things we’ve been taught on this trip. And finally, pray for future ministry teams that may make a similar journey in the future. It is apparent that this is a long-standing and fruitful relationship with our “sister church” in Pretoria, South Africa! Thanks so much for following along on this blog and we hope you have enjoyed “experiencing” this incredible journey along with us. We mostly thank you for your prayer support, which was felt daily. God Bless. What do 2 posts, 8 hippos & 1 winch have in common?.... Keep reading and you will find out! With our week of ministry with Hope Baptist coming to a close on Sunday, we spent Monday at the Pilanesberg National Park & Game Reserve, in the rain for the most part making the roads a bit slippery. It is a huge game park (over 220 sq miles in area) where people either hire a driving tour or do a driving tour themselves. We chose to take our van into the park, with our faithful Emmanuel driving yet again, and had a lovely time...for the most part. 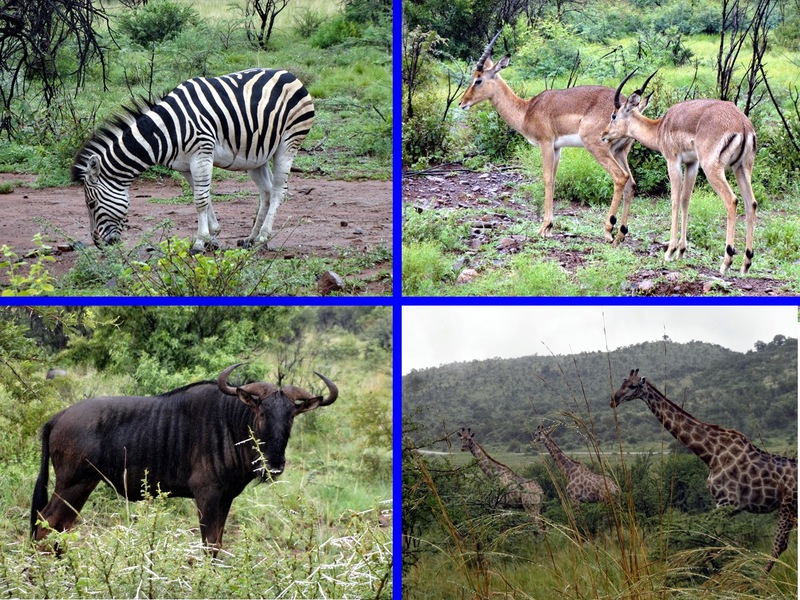 We identified 10 different birds and 10 different larger animals including giraffe, kudu, rhino, zebra, wildebeest, warthog, vervet monkey and our favorite visitor of the day, hippo. Though we did not find elephant or lion as we drove, we were in awe of God's beautiful creation! The signs around the park make it clear that you should remain in your vehicle at all times, except in special safe areas that are usually encircled with electric fencing to keep the animals at bay. interested and swam our way which then brought the other 7 with him. At this point we knew we were not safe out of the van and all climbed back into the van. This is when we realized we had another situation. No one had cell phone service. For a few minutes we watched as the hippos gave us a show. They snorted and "barked" and blew water and showed off their enormous mouths! Hippos are one of the most dangerous animals in Africa -- not because they hunt people but because the bulls are so aggressive. At any time during our "imprisonment" in the van we could hear short or long prayers being lifted up. God in his mercy not only kept the hippos in the water but allowed Pastor Julius to realize he had cell service for a brief time and he placed a call to the game park who then sent out "3 blokes" to help us out. 2 were professional hunters who came toting their rifles and one had a winch on his jeep which pulled us out with a bit of grunting and groaning. So, what do these 3 things have in common? As we reflected back on the hour and a half long ordeal we think that at one point or another they all kept us safe. The posts kept the van safe from sliding off the embankment, the hippos got us back in the vehicle so we would be forced to wait for the ranger keeping the van safe (as well as from sliding further off) and the winch finally set us free from our predicament. This is an example of your prayers' effectiveness. Even before, during and after you were praying for us, God knew what we would need, and that it would include 2 posts, 8 hippos and 1 winch! Today was our last full day in South Africa. Tomorrow will be packing up and beginning our long journey home. We are ready! "Salibonani Linjani!" We greet you in Ndebele which is a commonly spoken language in South Africa. If you were in the First Southern Scottsdale worship service this morning, this is the way we finished our live video Skype session with the church. What fun for us to see the beginning of the service from our side of the computer. encouraging us all to let our lights shine in the dark worlds we live in. No matter how dark the darkness is, light always penetrates. Pastor Julius recognized a number of police officers who had joined the service with police Bibles we had brought from the States. He also graciously recognized Pastor Francois Smit who is the pastor from the Dutch Reformed church whose building Hope Baptist uses. Hope Baptist Church would be a very different church without Pastor Francois. He has broken down many barriers and has a purposeful relationship with Pastor Julius. We said many goodbyes today as we will not see many of the church members again during our time here. Katie's friend Busi says "Even though parting is painful we part so we can meet. If we don't meet again here we will meet in glory." This afternoon has given us a much needed rest. After our Skype session with the congregation all 8 of us, Busi included, sat around a table and each shared a song that reflected our personal times here, along with a way God spoke to each of us during the past 9 days. None of us would have guessed the way God would have shown up in each of our lives. While we came to see how we might be a light to the African people, we were doubly blessed and know that the Lord allowed us to experience this trip for our own edification as well. God is a personal God to all of us, smiling down -- we are the ones He desperately loves. Tomorrow we will get up very early for a drive to a wild game preserve where we will see more of God’s creation and His creatures for our last full day here in South Africa. prepares to present a Bible to Francois. draped with South African flags. Where has the week gone!?! Can you believe we have been here a week? Nope, us either. Today began with a training for Children's Ministry workers and potential church planters. Mitch & Mona McDonald led their respective groups. Mel & Katie helped with the children's workers session and had a wonderful time with 8 other women, representing 4 different churches. Mona brought a great lesson on the different learning styles of children and the circle of learning, making sure the children have experienced what they need to in order to apply & practice a truth from Scripture. Mitch led a number of men in great conversation regarding future church plants -- Pastor Julius has a vision for 5 new church planters by the end of 2014. Not everyone had an “assignment” this morning, so some of the team got to hit the streets of Pretoria to experience a little more “up close and personal” view of the city. 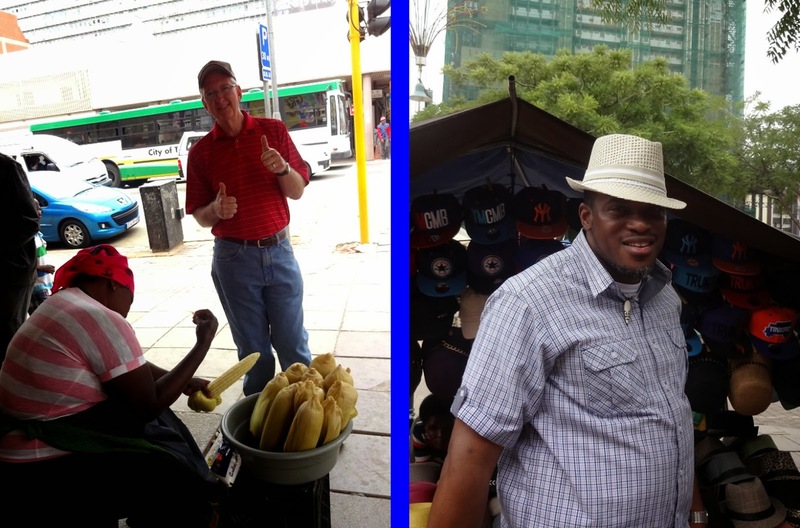 Kevin, Antoine & Keith (along with Emmanuel who you’ll read about next) put in about a 4 mile round trip on foot from the campus of Hope Baptist to Church Square (a famous center of Pretoria) and back. They experienced a lot of new sights, sounds and smells and gained a new appreciation for Pretoria and its people. Later in the afternoon, the entire team got the chance to go to an open-air market to do a little shopping, since we have had entirely full days prior to today and have not had such an opportunity. We need to mention someone who has been incredibly helpful to us and has made our trip much more than it could have been. Emmanuel has been our personal chauffeur all week, driving our rented van from where we’re staying to the church and back and all over Pretoria to find food or show us a new sight or wherever the team needed to go. He has taken off working as a driver of his "truck for hire" service in order to transport us. What an example of true servant-leadership. He is also the Evangelism Director with Hope Baptist Church. He was with the team of volunteers all week sharing openly the love of God! He has laughed with us on too many occasions and patiently answered questions as we seek to understand cultural differences. He is the brother we never knew we had, but now are so glad God introduced us to him! Thank you Emmanuel for loving us (and keeping us safe through the sometimes crazy streets of Pretoria)! We head to bed tonight in anticipation of a great day tomorrow at Hope Baptist Church as we get to experience our second Sunday worship service of this trip. We do not know what God has in store, but with the incredible week of sharing with hundreds upon hundreds of people that didn’t previously know about Hope Baptist Church, we can only imagine!